Engineering education is a dream for many students at their higher education stage in India. Fortunately, there are good colleges in India that nurture the future engineers. In fact, there are many engineering institutions in this country such that it becomes hard for the students and their parents to identify the best. In addition to these, many other departments are functioning under this institution. Recently, a report submitted by The Times of India read that more than half of the students, who were eligible for placements from this institution got jobs in the first phase of the placement season itself. Highest offer that was given to a student was $210000. This institution is located in the industrial town of Kharagpur in the state of West Bengal. This college earned AAAAA recently and it holds the pride of being the first among the other IITs introduced in the year 1951 by the Government of India. Some of the branches offered by this institute are electrical, computer science and engineering, civil, chemical, aerospace, agriculture and food engineering and biotechnology. The placement operations in this institute began in the year 2006 and recently in the year 2014, Google grabbed talents from this institution with a highest pay of $150000. This institution, which was established in the year 1959 is operating from the city of Kanpur, which is in the state of Uttar Pradesh. The institute earned AAAAA grading in a recent ranking study that was conducted. This institution offers B. Tech in branches like Metallurgical, materials, mechanical, electrical, computer science, civil, chemical, aerospace and bio engineering. In the year 2013, according to a report published in Business Today, 12 students from this prestigious institution bagged a package of Rs.1 Crore and even more through the placement drive. Top corporates like Google, Oracle and Linkedin grab talents from this institution. Established in the year 1961, this top institution earned AAAAA ranking recently. UG Courses are offered in branches like textile technology, production and industrial engineering, engineering physics, electrical, computer science, civil and chemical engineering. The institute has a great placement history and a separate department is functioning for the same. The institute came into being in the year 1958 and Bachelor of Technology course is offered in branches like materials science, metallurgical, mechanical, engineering physics, electrical, computer science and engineering, civil, chemical and aerospace engineering. As per the placement report submitted in the year 2014, IITians from Mumbai got Rs. 30 lakh plus job offers. Shortly known as VIT, this institution that has turned into University now was established in the year 1984. It is a private institution that was established as Vellore Engineering College. 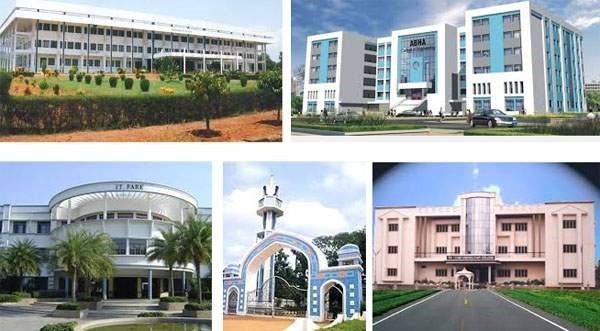 Different schools are functioning under VIT in the names of computing science and engineering, biosciences and technology, information technology and engineering, electrical engineering, social sciences and languages, advanced sciences, electronics engineering, mechanical and building sciences to offer different UG and PG courses in engineering and technology. The institute conducted VITEEE, an entrance examination for admission. When it comes to placement, the institute holds the pride of having association with top corporate like TCS, Cognizant, Accenture and Wipro and holds great placement records. This College, popularly known as TCE is an autonomous institution that came into existence in the year 1957. It is a government aided institution affiliated to Anna University. It is operating from the city of Madurai in the state of Tamil Nadu and the college offers Bachelor of Engineering courses in disciplines like mechatronics, computers science, civil, mechanical, electrical and electronics, electronics and communication engineering and B. Tech in information technology and B. Arch as well. Admission to this institution will be on the basis of the guidelines issued by Anna University then and there. They have a placement association with companies like TVS motors, TCS, Amazon, Wipro, CTS and many other local operators. Thapar University was established in the name of Thapar Institute of Engineering and Technology in the year 1956 and it gained the name of the university in the year 1985. Different departments like biotechnology, chemical, civil, computer science, electrical and instrumentation, electronics and communication and mechanical engineering are functioning under this university. This university operates from the state of Punjab and in a recent report submitted by India Today, it was stated that 12 students from this university bagged Rs.23 lakh annual package and during the 2014 placement drive, DE Shaw India offered the highest domestic package and Microsoft and Samsung also participated in the placement drive and hired 9 students, while Microsoft also hired 4 students. This university, which is run by Shanmugha Arts, Science, Technology & Research Academy is operating from the holy city of Thajavur in Tamil Nadu. This university came into existence in the year 1984 and it is a private university that offers UG and PG engineering courses through its school of EEE, computing, civil engineering, chemical and biotechnology and mechanical engineering. Admission is offered on the basis of the higher secondary scores. The student of this university recently got 1084 placement offers from recruiters like Microsoft, Amazon, TCS, etc.…. TCS is the leading recruiter, who gave 965 placements in the first phase of recruitment in spite of the current recession period. This university is shortly called as PEC University of Technology was earlier named as the Punjab Engineering College and it was established in the year 1921. Some of the courses in engineering offered are materials and metallurgical, mechanical, production and industrial, electronics and communication, electrical, computer science and civil engineering. PSG College of Technology, which operates from the Manchester Of Tamil Nadu, the city of Coimbatore, was established in the year 1951. It is a private and government aided institution with affiliation from Anna University. Admission to the different Engineering courses offered by this institution will be on the basis of the norms issued by the Government of Tamil Nadu. Both UG course and PG courses are offered in a number of branches of engineering. The mechanical engineering discipline holds the pride of getting the utmost placement in the year 2014, while the least number of students was placed from Biomedical engineering course. This institution was established in the year 1983 and it was formerly called as Delhi Institute of Technology. This institute offers courses in nanotechnology, biotechnology, information technology, manufacturing process and automation, instrumentation and control, computer engineering and electronics and communication engineering. Admission is based on the score of candidates in All India Rank obtained in the JEE main examination conducted by CBSE. Formerly called as RECW or Regional Engineering College, Warangal, this institute was established in the year 1959. It is located on either side of the Hyderabad, Warangal Highway and it holds the pride of being the first among the other RECs in India. The departments functioning in this institute are biotechnology, computer science, chemical, materials and metallurgical, electronics and communication, mechanical, electrical and civil engineering. When it comes to placement, this college holds the pride of being in the 4th position among the T-schools in India. Cent percent placement was given to the students from the Department of Computer Science and Engineering. This institution operating from the city of Tiruchirappali in Tamil Nadu came into existence in 1964. B. Tech in 9 engineering disciplines are offered by this institution and B. Arch is also offered. During the admission process, 60% of weightage is given to IIT JEE score of candidates, while 40% weightage is given to the higher secondary marks. Every year, nearly 160 companies participate in the placement drive conducted every year. This college holds the third position when it comes to placements. This institute functions from the state of Karnataka and B. Tech is offered in civil, chemical, computer, ECE, EEE, IT, Mechanical, mining, metallurgical and materials engineering. JEE score is the criteria for admission. West Bengal is the home for this institution that was established in the year 1960. TCS is the highest recruiter from this institution as per the 2012 records of this institution. The next positions are held by Tata motors and Samsung with respect to the Durgapur NITians recruitment. This institution was set up in the year 1961 as the Calicut Regional Engineering College. The institution holds the pride of one among the very few colleges in India that hold a super computer on their own. Courses like mechanical, ECE, Electrical, chemical, computer science and civil engineering courses are offered. Admission is done through JEE main scores and AIEEE scores are also considered. It has an excellent placement record with Samsun, Satyma, Time, DLF, Microsoft, CTS, Google Intel, HSBC as their top recruiters. Computer science and engineering students are the most hired from this institution. It is an autonomous engineering college offering civil, EEE, mechanical, ECE, Metallurgical and chemical engineering. The college was introduced by the Government of Telengana in the year 1965. It was established in the year 1955 and it is a public institution operating form the state of West Bengal. Not only engineering, but, science and arts faculties are also functioning under this university. WBJEE or West Bengal Joint Entrance Examination scores are taken for admitting students to the UG engineering courses. It is functioning from the state of Andhra Pradesh and came into being from the year 1998. It has earned affiliations from AICTE, AIU, NBA, NAAC and UGC. JEE main score is taken into consideration for admission of candidates. This institution, which is popularly called as IIIT-B came into existence in the year 1999 and unlike the other institutions given in this list, it is meant for offering only PG courses. Some of the courses offered are M. Tech, integrated M. Tech, Master of Science by Research and Ph. D. Even though, it is meant for PG education, the integrated course extends for a period of five years and for this course, students can join after completing their higher secondary education. On successful completion of these five years, they will get both B. Tech and M. Tech in Information Technology. Admission to this course will be on the basis of JEE score. This institution was established in the year 1926 and it is affiliated to the Ministry of Human Resource Development in India. This college also offers dual degree of B. Tech and M. Tech apart from B. Tech course alone as well. The IIT-JEE score is taken for admission to UG and integrated courses in different branches. This institute is relatively new among the IITs in India and it was established in the year 2008. Earlier it was referred to as IIT, Punjab. B. Tech course is offered in three disciplines, namely mechanical, electrical and computer science and engineering. The second placement drive was completed by the institute in the year 2013 and companies like Texas instruments, Cisco, Cognizant, Cisco, Samsung, eBay, Microsoft and Facebook recruited candidates. This institute, which was established in the year 1847. With nearly 167 years of existence, the institute offers B. Tech in 10 disciplines and B. Arch course too. In the year 2014, 90% of the students got placement offers at a stand of Rs.73 lakh. This institute is located in the Medak District in Telangana and it came into existence in the year 2008. The UG engineering course is offered by the institution in 8 disciplines and in the placement season, 52 companies participated and about 85% of them were placed. The average package worked out to Rs. 9 lakhs per annum and many students, who were interested in higher education too got admissions in top international institutions like Columbia University, Standford, University of Tokyo, etc.….. In short, Indian Institute of Technology in India always holds the pride of being the best for engineering education in India and it is the dream of many candidates to join prestigious IITs functioning from this country. Even though 7 of them are old, at present there are 16 IITs functioning in India. Next to IITs, the Regional Engineering College, which is presently called as National Institute of Technology operating from different parts of the country are also popular for their quality education. Admission to the IITs is based on the marks secured by the candidates in the Joint Entrance Examination called as IIT JEE. However, to apply for this entrance test, the candidates should satisfy the appropriate requirements. It is expected that for the year 2015 admissions IIT JEE examination, there will be a change in eligibility requirement and candidates can gather appropriate information from the website of IIT JEE. Some sources say that the top 20 percentile norm, which was so far followed in the admission process, might change and be replaced by a common cutoff of 75% marks in class XII board examinations. The Joint Entrance Examination Score will be considered for admission to other central funded engineering colleges in India like NITs as well. So, if you are a class 11 or Class 12 student interested in getting admission in any of the top 20 engineering colleges in India, start your preparation from now on, so that you can score well in your class 12 board examination and can become eligible to apply for IIT JEE. Engineering is my choice . Thanks a bunch. I was kept on searching for best colleges. I am interested in aeronautical engineering. Please help me to search best colleges for my destination…..Thanks again.